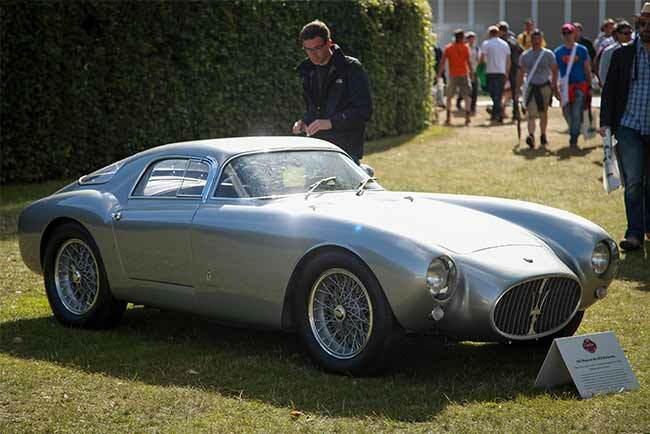 A sensational Maserati A6 CGS Berlinetta wins ‘best in show’ at the 2014 Goodwood Festival of Speed’s Cartier ‘style-et-luxe’ concours d’elegance at the weekend. The event celebrated its 20th running at the Festival of Speed and celebrated the best in exquisite automotive design throughout the history of motoring. The Maserati, owned by Egon Zweimuller Jr, took victory in the coachbuilt Maserati-only Class 3: ‘The height of fashion’, and later beat off competition from the other class winners to claim the overall top spot. The judging panel was chaired by Mail on Sunday editor Geordie Greig and also featured Olympic gold medallists Sir Chris Hoy and Sally Gunnell, actor Rowan Atkinson, Apple design chief Sir Jonathan Ive and renowned handbag designer Anya Hindmarch plus other notable names from the worlds of sport, the arts and design. Class 1: ‘Vintage Voiturettes’ was won by Keith Bowley’s 1925 Amilcar CGS while victory in Class 2: ‘Blown Away’, which was held just for Mercedes 500Ks, went to Winfried Ritter’s Cab A model. A 1960 Lincoln Continental, owned by the La Salle Collection, triumphed in Class 4: ‘Affairs of Status’, while Class 5: ‘Mid-engined masterpieces’ went to Stephen Keen’s 1968 Lamborghini Miura P400S. Bill Shepherd’s 1966 Ford Mustang Mustero won Class 6: ‘Horses for Courses’ which celebrated American cars powered by small-block V8 engines, while victory in Class 7: ‘Best foot forward’, marking front-engined British sportscars of the 1990s, was won by Graham Abbott’s 1997 TVR Cerbera Speed 12.